His kids think he’s fun. His wife thinks he’s an idiot. Audiences think he’s hilarious! Don is a modern suburban dad just trying to raise his kids and get through the day with a bit of money in the bank and a scrap of dignity intact. With a unique style that can best be described as frenetic and engaging, Don captures the irony of parenting, marriage and everyday absurdities through characters, voices, parodies and some of the best written routines around. He’s a wanna-be geek who constantly upgrades to the latest technology, but can never get it to work, leading to signature bits about tech support, Idiots Guides, texting and passwords. Friesen has recently taken his smart, savvy, and highly-caffeinated comedy to the stage at the Alex Theatre in Glendale, CA, for the taping of his new Showtime one-hour special titled "Ask Your Mom." In his first nationally released concert special, Don delivers a winnng hour of clever, true-to-life “he’s talking about my family up there” comedy that manages to be adult-smart yet family-friendly. Don’s first one-hour Showtime Special “Ask Your Mom” premiered in June 2012. This hourlong special combined the best from Don’s self-produced DVD, “Inexplicable” with new signature bits about parenting, texting, Lasik surgery and a play on words that you’ll be repeating all week. Filmed in HD at the stunning Alex Theater in Glendale, CA this winning performance is a high octane spoof af daily life as seen through the eyes of a husband and dad of two who’s just trying to get through the day with a little money in the bank and some dignity intact. “Ask Your Mom” is currently available as a DVD through Don’s store. By winning the competition in 1999, then returning to win it again in 2005, Don became the only to comedian in the competition’s storied history (dating back to 1976) to ever win it twice. 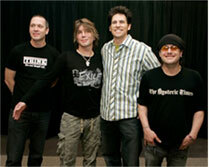 Other past finalists include luminaries such as Robin Williams, Ellen DeGeneres, Dana Carvey, Sinbad and Dane Cook. More people have heard don on satellite radio than any other medium. He continues to be one of the most played comics in the country mostly on Laugh USA and Blue Collar Radio. He is also featured regularly on “Laughter at 45 After” on The Sound 100.3fm in Los Angeles. Don had a chance to perform for a crowd of 8,000 at the Delta Center in Salt Lake City UT, opening for the Counting Crows at Novell’s 2006 International Brainshare Convention. He was such a big hit that they invited him back to perform the next year for an audience of 10,000 at the the same venue--this time opening for the Goo Goo Dolls. 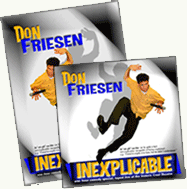 In the summer of 2006, Don released his first DVD “Inexplicable,” a self-produced effort that was filmed at the Crest Theater in Sacramento, CA. It was a limited release that met with rave reviews. His CD of the same name was re-released in the summer of 2007 through a comedy label and got the attention of the comedy channels on XM Sirius satellite radio, where it became wildly popular and has been in daily rotation ever since. Inexplicable is currently available through Don’s store.